A friend of mine has some work in Moscow and he asked me to come over and hang with him for a bit. I had some other commitments and an unexpected turn of life events so I could not leave until Sunday, 20 August. 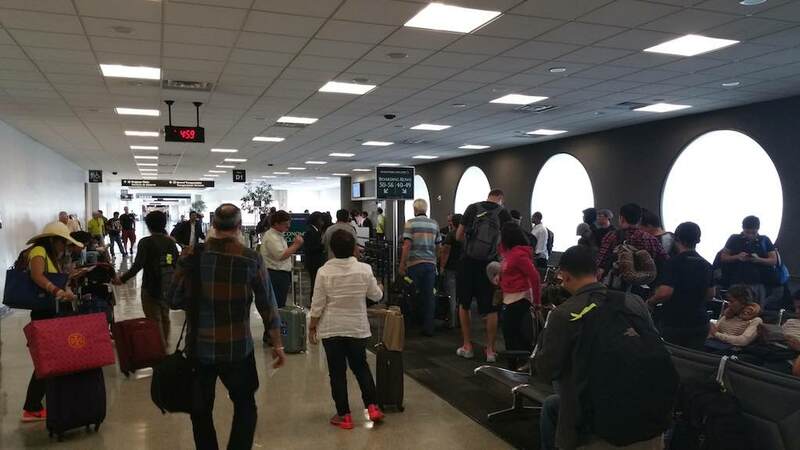 I was also delinquent in getting a visa together, but in the end it all worked out and I boarded Singapore Airlines 61 at Houston-George Bush Intercontinental airport (IAH) bound for Moscow (DME). As soon as I knew my visa would be going through, I got a ticket from Singapore Airlines. 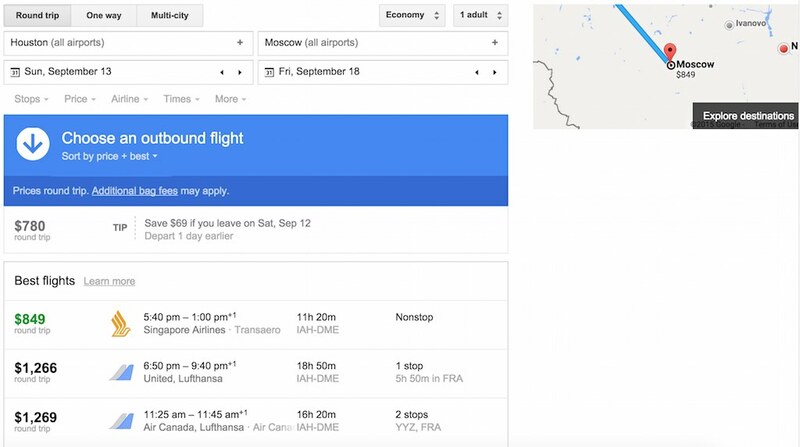 I had looked at other ways of making the journey using my own tips that’s written here, but the cheapest and the simplest came from Singapore Airlines with nonstop service from Houston to Moscow. My disappointment though was that the cheapest fare earned me 50% miles on Singapore Airlines zero on United (it is booked in N class) and the next cheapest fare would only earn me 50% if I used my United MileagePlus account but 100% if I used my KrisFlyer account (booked in W class). Torn, I booked in W class so I can get my United mileage credit. Neither fares are eligible for KrisFlyer mileage upgrades. 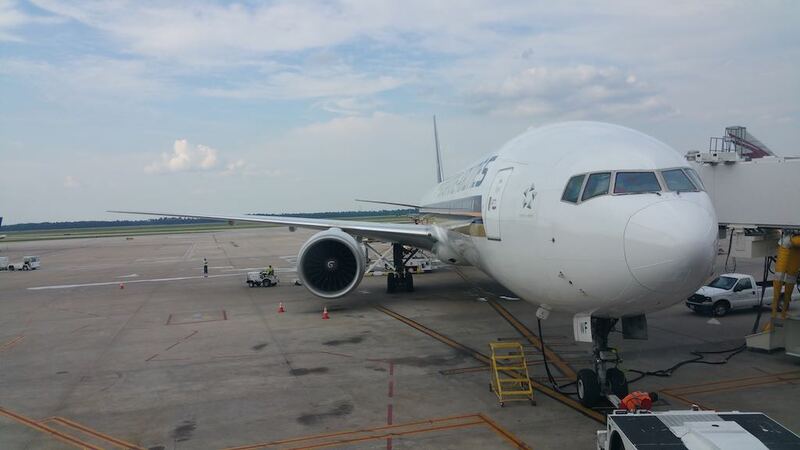 Singapore Airlines IAH to DME – 826.39. 50% credit on Singapore Airlines KrisFlyer and 0% credit in United Airlines MileagePlus program. 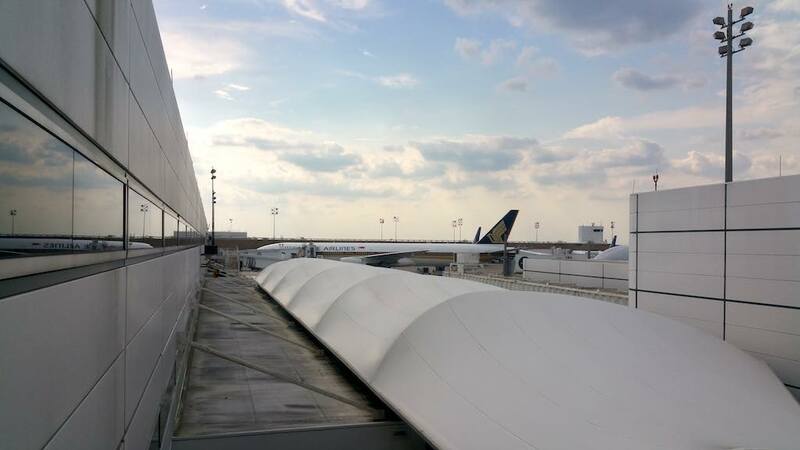 Singapore Airlines IAH to DME – 968.39. 100% credit on Singapore Airlines KrisFlyer and 50% credit in United Airlines MileagePlus program. So although both airlines are in Star Alliance and are actually founding members, the mileage earnings is not the same :-(. So when you are buying your airline tickets, ensure that you will get the appropriate credit by checking the earnings for the bucket you are purchasing. 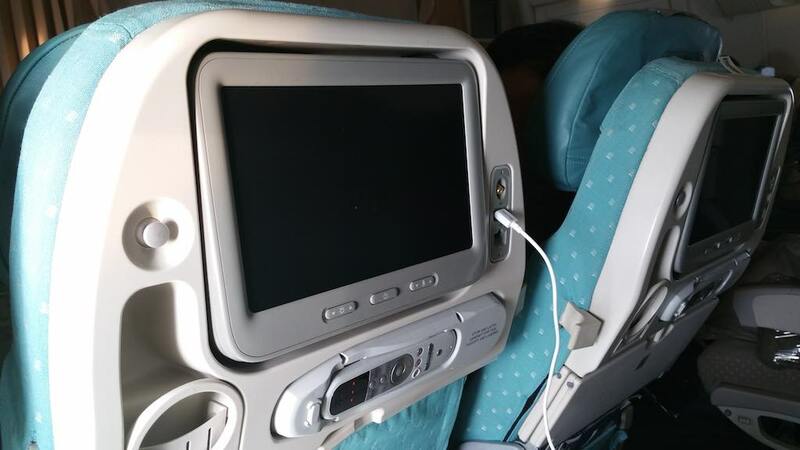 I had a similar issue with Cathay Pacific and American Airlines recently, where I flew from Hong Kong to Taipei, Taiwan and I got zero credit as it was a discounted bucket and I was not paying attention. Now, I’d been to Moscow before, but just to the Sheremetyevo (SVO) airport on my way to Hamburg, Germany (HAM) earlier this year. So it was time to get out of the airport and explore the city. The day before departure, I received an email about my check-in information. I then downloaded the Singapore Airlines App (Android | IOS) and started my check-in. I used my United MileagePlus number to get credit, but noticed that they still had Copa Airlines and United under the same dropdown. I believe that Copa now has their own program which is called ConnectMiles. I saw a window seat with the middle and aisle, available in the 30s and changed to that seat from my seat in the 50s. When I had booked the entire 50 row on the A side was open and now the middle and aisle were occupied. So I figured if I was going to sit next to someone, I might as well sit closer to the front of the plane. I got all the way to the end of the check-in process and was advised that I could only collect my boarding pass at the airport. I assumed that was due to the fact that they had to check my visa. With all the ticket and visa items cleared, I was ready to head to the airport. I got there a little early so I could get a photo of the aircraft landing. 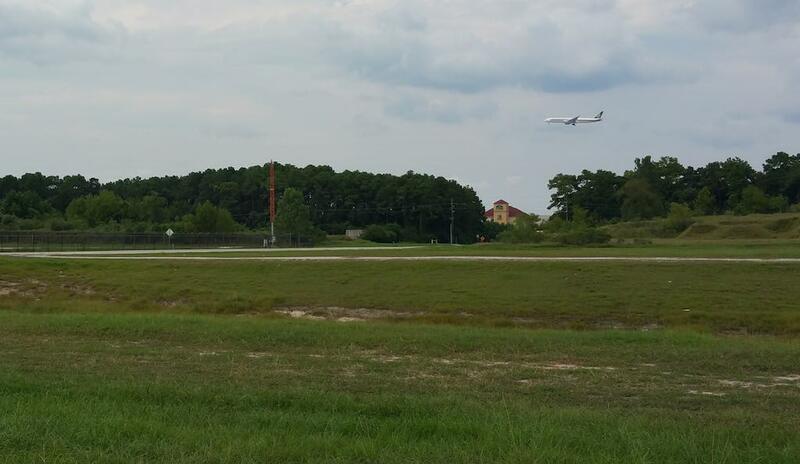 Of course it landed on the other runway, so the photo is a long distance one. I dropped off my Avis rental car and took the bus back to Terminal D. As I entered the terminal, there’s an area for First, Business class and Economy class. Star Alliance Gold members can use the First and Business class area (I’m sadly currently Silver; long story). Don’t think I would have any special treatment as I have to be Gold to get and to get anything special with Star Alliance or any of the Alliances for that matter. I approached the lady standing next to the scale. She inquired where is my luggage and I pointed to my backpacks. She gaped, but remained calm and tagged my larger backpack with a bright colored tag that said cabin baggage or something similar. 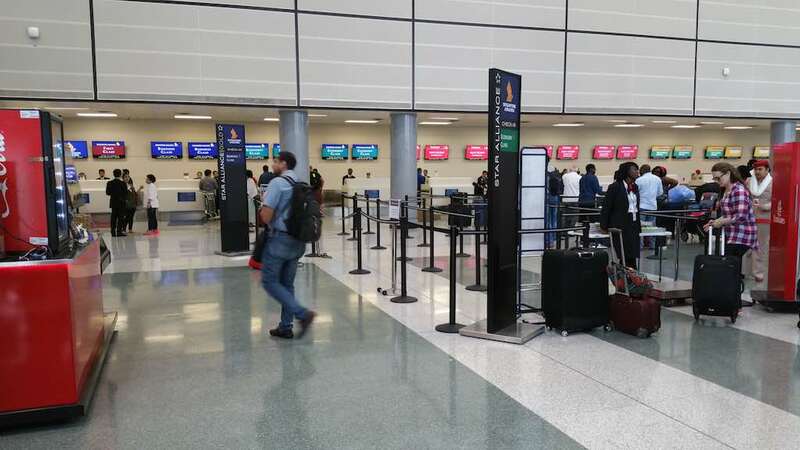 She them ushered me to the counter where check-in was a breeze as there was no one waiting. The Emirates A380 line to my right was brimming with excitement and many people weighing bags. The First and Business class lines for Singapore Airlines to my left were empty except for two passengers at the counter. The agent took my passport and after a few pleasantries, I was checked in. I asked if the seats next to me were empty and he said “Yes.” I was a bit confused as they showed occupied online. I guess they were initially blocked in case someone was booking all the way through to Singapore which is the final destination for SQ61; Moscow is an interim stop. So on day of departure they just open them all up so anyone can take them. Yeah, I thought, let’s hope they stay that way. I asked the agent about an upgrade and he told me to talk tot he Singapore people. Ah, he’s a contractor. I decided not to ask the Singapore Airlines agents as they seemed busy. I then headed to security a little bummed that I did not get TSA Pre since Singapore Airlines does not participate in the program the agent said. I had to join the regular queue which I’d not done in I don’t know how long :-(. At least they had a thing that said if you are here it will take you x time. For me, it would be about 20 minutes. I actually have a meeting in 15 minutes, so there goes that timing; I’ll be late for it. I trugged along and eventually I got the agent who was kind of a drill sergeant shouting at everyone to “next person step forward” or something like that. Why can’t they be civilized with people? Is that asking too much? Anyway, I went through security and had to use the machine where I have to take all from my pockets. Once through, I put everything back and could not find my passport :-(. I searched everywhere and I had placed it in my backpocket; how silly. Annoyed and a bit embarrassed I headed to the United Club, since Singapore uses that Club in Houston. 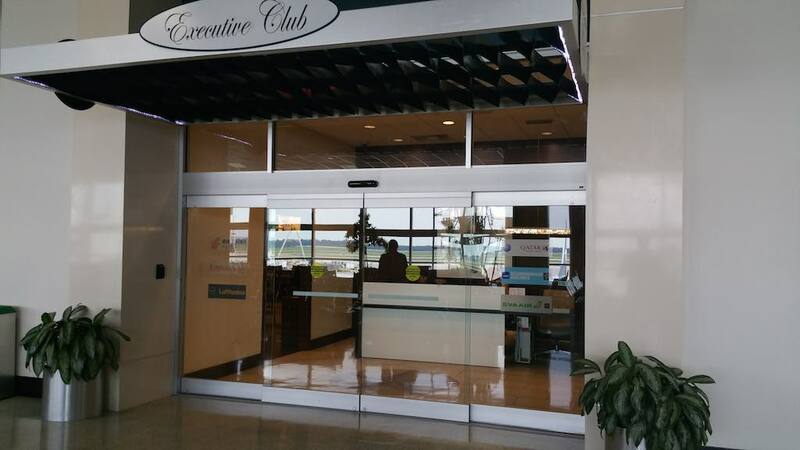 There is an Executive Club in Terminal D (used by Air China, Emirates, EVAAir, Lufthansa, SAS, Qatar) closer to the airplane, well kind of, but being a Star Alliance member, it makes sense to use the United Club as that’s what the whole Alliance thing is all about. 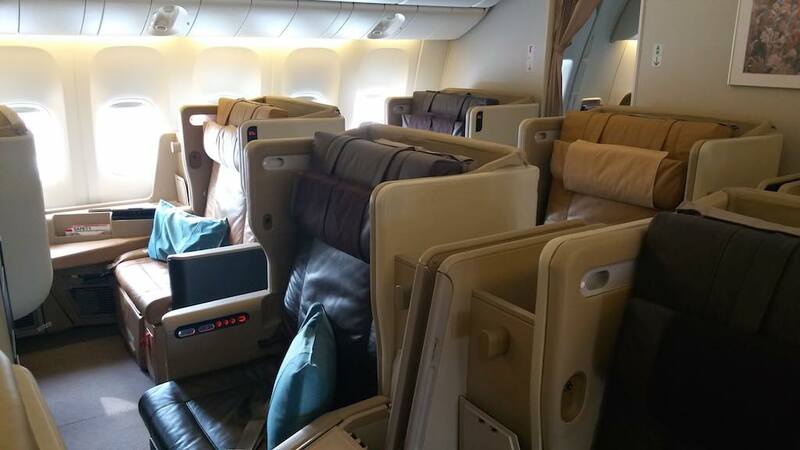 Although, Star Alliance partners Eva Air, Lufthansa and SAS both uses the Executive Club; not sure what’s the deal there? I presented my boarding pass, expecting to gain admittance without showing my United Club card and was denied. If I was United Premier Gold, then I would be Star Alliance Gold and all would have been well. But as I’m silver it rejected me. But all it had to do was just put my MileagePlus number into the system and used that instead. I guess that’s not coded. So I told the agent to enter my number, which worked since I have United Club membership and my MileagePlus number is the account number, and then I had to produce my passport as an ID. Voila, I’m in. For some reason the agent wanted to print me a new boarding pass, but the other agent told her she can’t do that as its a Singapore ticket. I don’t even know why the agent though that would fix the issue? I found a seat in the crowded Club; it usually is at this hour, it was about 3:30p. Got some eats (vegetable soup and some mixed nuts) and a glass of house white and had my meeting via Skype. At 4:45p I left for the gates as boarding had started at 4:40p. I was way at D1, which was quite the walk from the Terminal E United Club. I should have really used the Club in C which was closer. When I got there they had already boarded my rows (I’m in Group 6), so I just breezed by the others that were row 40 and beyond. After final security checks and boarding pass scans and passport checks, I walked down the jetway after passing the Immigration checks canine and all. I greeted the two gentlemen at the door and they told me to go right and pass the Business class seats (1-2-1 configuration) to my Economy class seat (3-3-3 configuration). 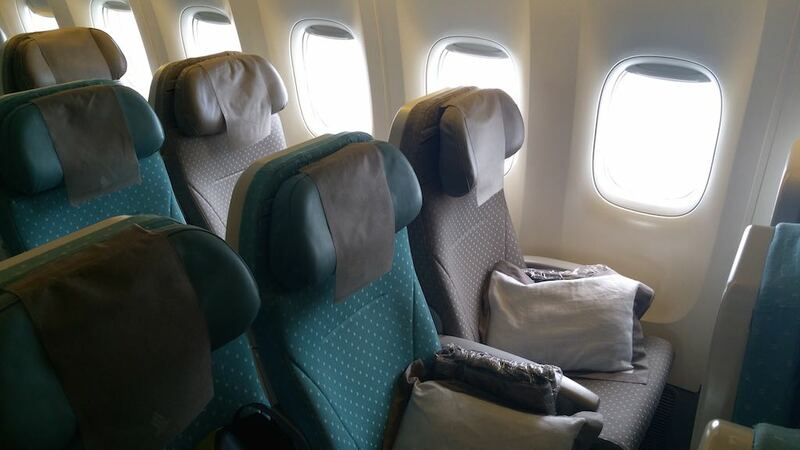 To the left were the First class seats. This airplane does not have the new enhancements promised by Singapore Airlines just yet. Hopefully on the way back, I’ll be so lucky. Before takeoff, we had a hot towel service; awesome! Followed by headsets distribution and then a menu. 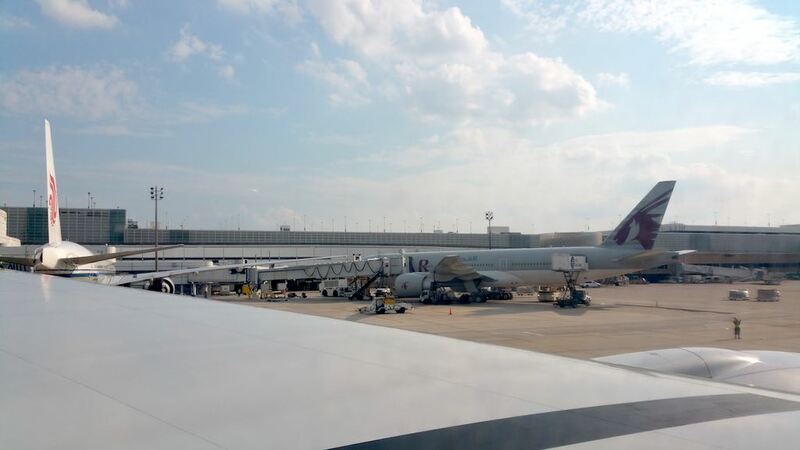 We pushed back about five minutes early and I had a clear view of the Qatar Boeing 777-200LR to my left as well as a Air China’s Boeing 777-300ER. 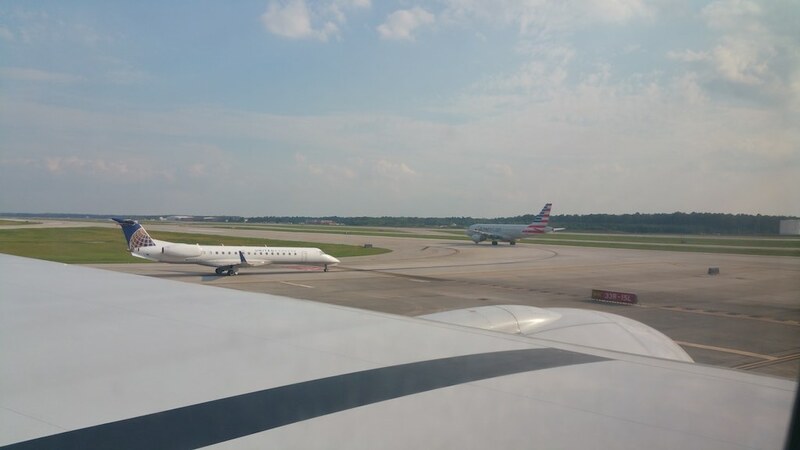 We then headed for the runway and without delays were airborne behind an American Airlines Airbus 319. I’m still amazed at the amount of power generated at takeoff from these two engines! 90,000 lbs of thrust I believe. 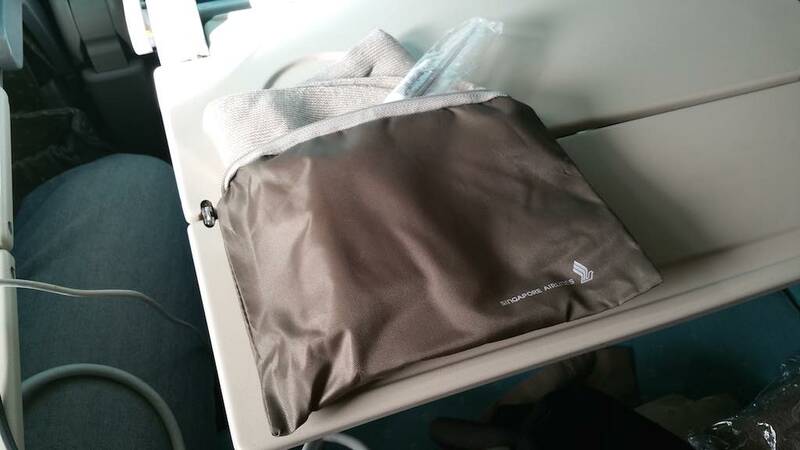 As soon as we leveled off and the seatbelt signs went off, it was time to start the service; first, we got an amenity kit which contained a cream colored sock, toothpaste and toothbrush. First the flight attendants came by with drinks. Proper wines from proper glass bottles! I was thrilled. Of course I could have whatever alcohol I wanted including the famous Singapore Sling, which sadly I forgot to order, but will do so on the way back. 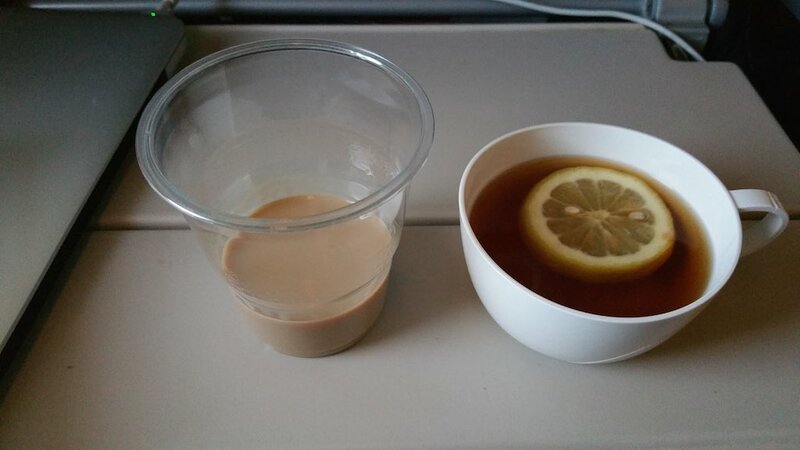 It’s the only place in the sky where you can get one of these drinks. I opted for both the Chardonnay and the Reisling, well I had to check them out :-). This was served with peanuts. Then they ladies came back with more drinks as they cleaned up. The meal arrived and it was not served with style. One of the flight attendants stooped down and asked me what do I want and it was not just “pork or fish” it was an explanation of what came with both dishes. She did this for each passenger who had not heard her before and smiled each time. How cool is that? I took the fish and although a little salty for my taste, I enjoyed it nonetheless. After the main meal service came ice cream as a dessert, followed by coffee, tea and more drinks so I had some Baileys and tea with lemon. After that I was totally stuff and soon fell asleep while watching a movie. Speaking of movies. I had more movies to watch that the flight time I had which was 10:40. I settled on “I Kissed A Girl” which was quite funny. It’s about a gay guy who slept with a girl and what happens next. It’s a French movie with English subtitles, so you have to pay attention. Worth watching. It’s one of the things about flying other airlines is that you get a lot of different movies. This one was in the European category of the listings. Singapore Airlines does not make it easy at all; there are 295 movies, 470 TV shows, 872 CDs and 6 radio channels to choose from. I’d have to be living onboard for a few months to consume it all. 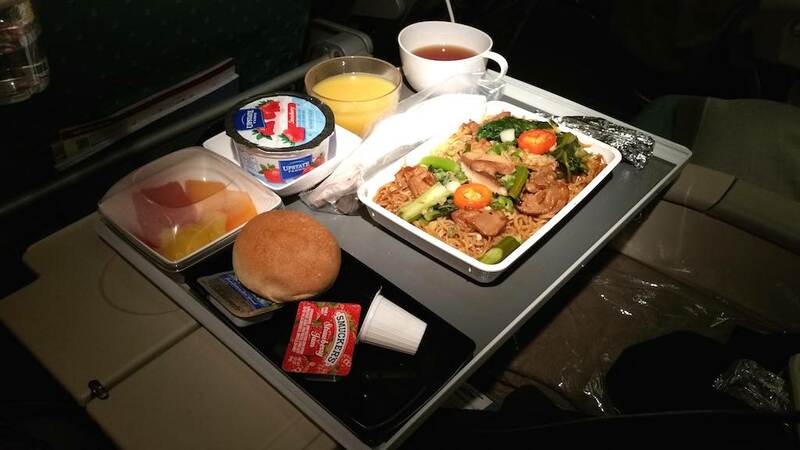 After I awoke; I think I was asleep for about three hours, I went to the middle of the plane to get some eats. 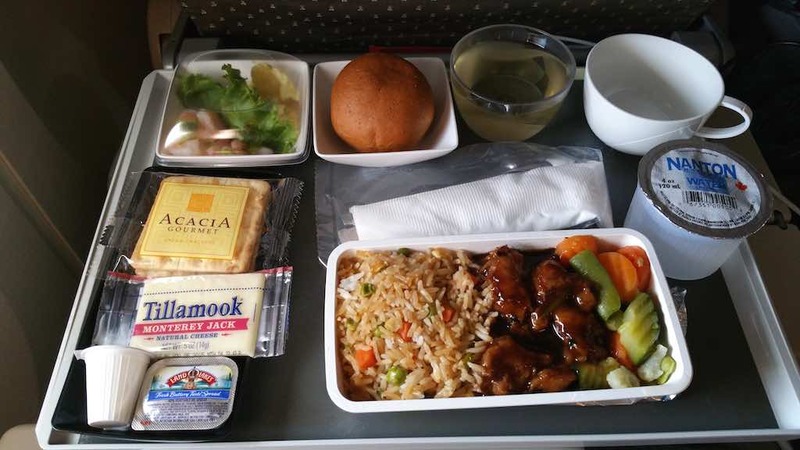 There was food there, but I wanted to speak to the flight attendants so I headed for the rear galley. The cabin was dark and almost everyone was asleep amid the glow of the screens. In the rear galley, I made a restroom visit in one of the two restrooms nearby, then popped my head into the galley. 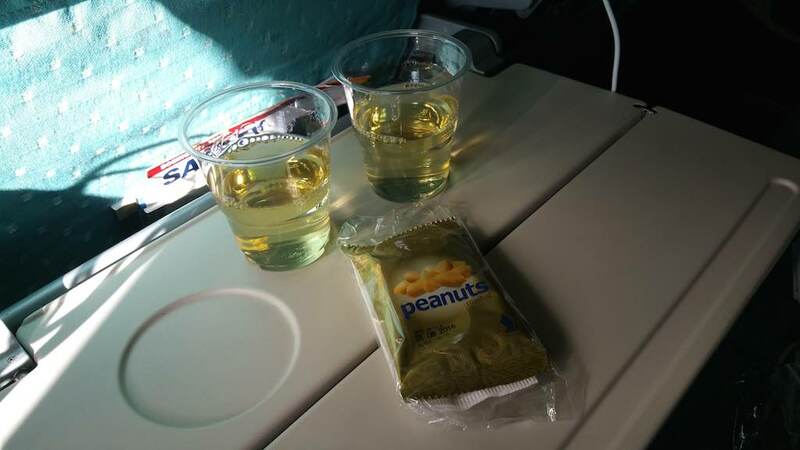 I asked for some apple juice and one of the flight attendants obliged asking me if I wanted some snacks; yes I replied. She then produced a basket (I did not have the camera with me) full of goodies; bananas, chips, biscoff, chocolate and sandwiches wrapped in plastic. My eyes bulged as I took a turkey sandwich, a banana and a biscoff. I worked on my computer that was plugged into the power socket on the armrest. My phone was being charged via the USB port next to the screen in front of me. The only missing item was Wifi. 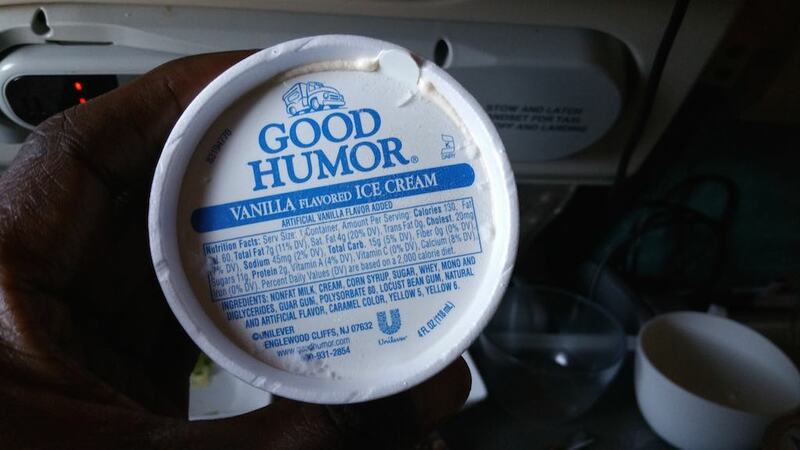 I asked, but the flight attendant advised that this aircraft was not equipped. I continued working and was pleasantly interrupted by water and juice services a few times; well done. 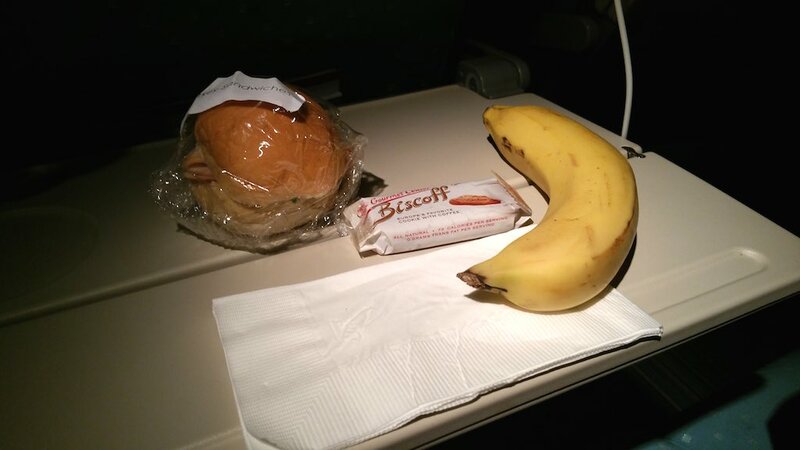 With about two hours to go and 37,000’ over Ostersund, Sweden, we were served breakfast. (2:47a in Houston). I choose the noodles and was impressed by how much it was! I was stuffed by the time I was done. I could not have it all. Tea followed. Yes you can have coffee if you wished. Or whatever beverage you’d like. Soon, it was time to prepare for landing in Domodedovo (DME). Window shades open are mandatory (yeah! ), chair tables up, unplug stuff and get ready. Oh, the recline is decent, with the seat sliding forward and there is also a footrest plus a pretty big pillow and thick blanket. After putting stuff away, I was ready for Moscow. We landed safely in a clear day and taxied into the runway passing old and new planes as we did so. 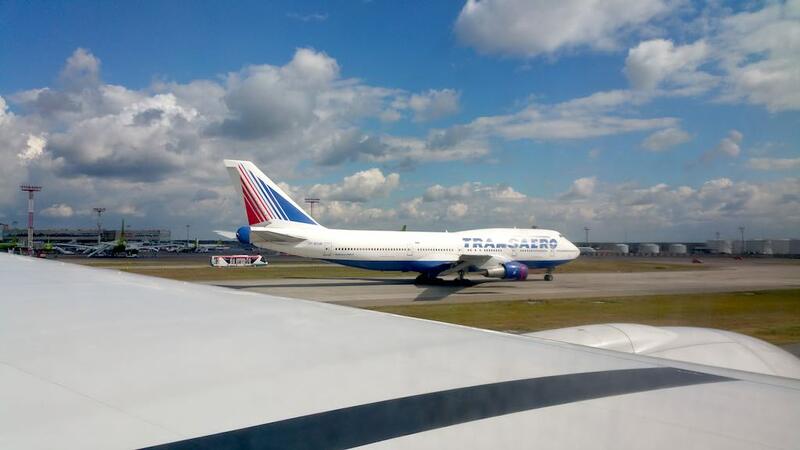 Saw a few Transaero Boeing 747-400 and Boeing 747-300, plus a Turkmanestan Boeing 777 as well. Also a number of S7 airplanes as well. There seem to be a small airplane graveyard across the way as well. We got a gate and waited until the First and Business class passengers had disembarked then it was our turn. This took about 10 minutes or so to accomplish. I disembarked and then headed for Immigration and Customs. The lines were not yet long, but as I waited, they became longer. The lady directing traffic thought I was in transit to Singapore but I told her I was not and she pointed me in the right direction. The Immigration agent took a little while to sort me out as she was not too impressed by the sewing and the tapes used to secure the new pages. She must have checked 10 times and finally she stamped me in without a word. 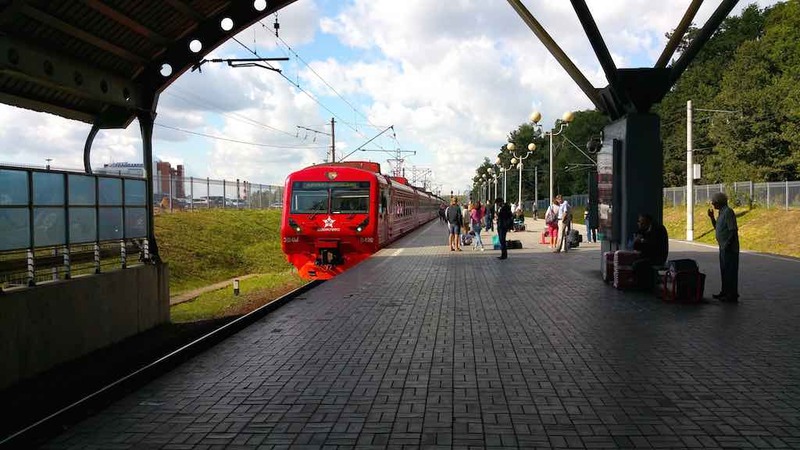 I then cleared Customs and headed out into the arrivals area, walked around for a bit and hen found the train into the city, boarded it and relaxed. Thanks Singapore Airlines for a wonderful trip from Houston to Moscow. Have you taken this routing on Singapore Airlines? How was your trip? Please leave a comment below. Sounds like a little while back :-). The U.S. to Manila still take a while. One of their flights actually stops in Guam along the way.